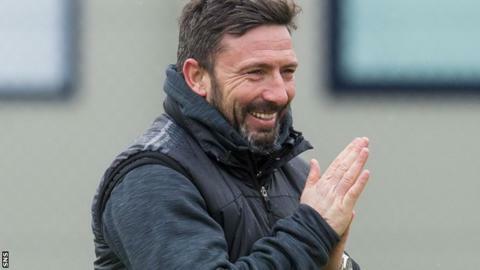 Derek McInnes wants to see his side bounce back from defeat at Inverness and keep their title hopes alive with victory at Partick Thistle on Friday. The Dons can move level with Celtic at the top of the Premiership with victory at Firhill, albeit having played two more matches. "The players are eager to get back to winning ways," McInnes said. "It's important to keep the games we lose to a minimum and try to make sure we bounce back with three points." McInnes stressed that his side will face a stern test against Thistle, and warned the condition of the pitch could also make life difficult. "They're a good team. They're a team that I admire greatly, how they go and try and win games. I think they're who will still have top six aspirations. "They are a side who are capable of getting results against anybody so we've got our work cut out. Equally they've got their work cut out against us, and we need to go down there and show what we are capable of. "It'll be a tough game for us. The pitch might be difficult. It might not be pretty on the eye at times for both teams but we have to try and find a way to win." McInnes, who confirmed that winger Jonny Hayes will miss up to a month's action with a hamstring injury, expressed his "surprise" that no retrospective action has been taken over the penalty awarded to Inverness Caledonian Thistle in Monday's loss in the Highlands. The Dons boss was furious after the Dons' 3-1 defeat, saying Ross Draper had "conned" referee Willie Collum to set up the spot-kick converted by Greg Tansey. "There was anger and frustration at the time but it's done and dusted and we move on," said McInnes. "There's no real merit in us getting involved in that. "While there is anger from everybody at the club, you just hope that things get dealt with properly." The penalty was given when Draper and Aberdeen defender Ash Taylor both had their feet up high when challenging for the ball. And the Caley Thistle midfielder was adamant that there had been sufficient contact for him to go down. Draper was quoted saying: "Just say what you believe. I thought it was a penalty. That's me being honest. If he [McInnes] thinks it's a dive then say so." Asked to respond to Draper's remarks, McInnes replied: "I said what I had to say afterwards and that was clear. I think the incident is clear as well."